The Last Adventure reaches its penultimate instalment, ‘Stage Fright’ by Matt Fitton, in which the Sixth Doctor and Flip visit Victorian London to expand Flip’s cultural and historical knowledge in what becomes a spectacular blending of eras as the two confront none other than theatrical impresario Henry Gordon Jago, noted pathologist Professor George Litefoot, and plucky barmaid Ellie Higson. This incarnation of the Doctor has, of course, crossed paths with these investigators of infernal incidents on multiple occasions before within the Jago & Litefoot audio series and with two important trips in ‘Voyage to Venus’ and ‘Voyage to the New World,’ and there’s an instant sense of camaraderie between Colin Baker, Christopher Benjamin, Trevor Baxter, and Lisa Bowerman that makes this dangerous locale come to life with such character and charm. With the notoriously miserly Jago more than willing to pay for everyone’s food and drinks because of the advance payment of one Timothy Yardvale who has rented out The Grand Regency Theatre to privately perform his plays centred about a series of strangely familiar death scenes, it seems that something may be amiss. ‘Stage Fright’ is a story steeped in nostalgia for all of the long history of Doctor Who, and the Valeyard taking centre stage in embellished performances of the first five Doctors’ death scenes is a remarkable conceit in and of itself that allows Michael Jayston to act with a certain dramatic flourish that he clearly enjoys. Against the backdrop of aspiring actors going missing in London, the notion of dead bodies wearing approximations of the outfits of the Doctor’s previous companions is a staggeringly dark visual that ensures the complete attention of the Doctor who knows he is walking into a trap. The audio medium does take away a bit from the shock factor, but it’s nonetheless a chilling moment that perfectly complements the Valeyard’s use of the machine he stole in ‘The Red Door’ to steal his actors’ emotional energies and eventually lives to become stronger for his final confrontation with the Doctor. This is easily the Valeyard’s strongest role yet, and Jayston delivers on all fronts with an immaculate and powerful performance. Aside from the need for a theatre and the Valeyard’s implicit understanding of the Doctor’s timeline, the characters of Jago, Litefoot, and Ellie aren’t necessarily vital to the overall affair. 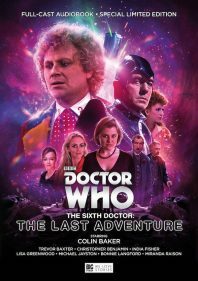 At the same time, however, it’s difficult to imagine this portion of the celebration of the Sixth Doctor’s life taking place anywhere else, and everything about this Victorian setting and its denizens sparkles in every regard as the Doctor’s old friends discover the power of the Red Tavern’s steak and kidney pie and libations and Litefoot compares regeneration to religious aspects he has encountered over the years. At the same time, the inclusion of Flip as the companion of the piece allows the unique relationship more akin to a parent and child to once more manifest, and Lisa Greenwood’s infectious enthusiasm meshes excellently here with the Doctor’s impending sense of doom and righteous indignation at what is transpiring. The manner in which Flip seems to overcome her stage fright stemming from a year three talent shows is perhaps a bit suspect given that her bravery comes in an empty theatre, but this is easily the best portrayal of Flip yet, and she proves just how shrewd and loyal she is and humorously manages to compare the very complicated story of the Valeyard to that of Darth Vader and Doctor turned to the dark side. The companion and friends here may not represent the quintessential grouping for the Sixth Doctor, but ‘Stage Fright’- with its macabre atmospere, thrilling performances, and wonderful direction and sound design- is a spectacular exploration of the many friendships the Doctor has formed throughout his many lives, celebrating his death in the most theatrical fashion imaginable and vividly foreshadowing his impending regeneration as the Valeyard expertly moves his nefarious plan forward.